All across the country, universities are resuming classes. How exciting! One of the toughest things about formulating a new class is working up the syllabus. Every teacher wants to bring something new to the students – something they wish they themselves had the opportunity to read when they were taking a similar class, perhaps. Or the chance to share with their students something they are working on and thinking about now, really drawing the class into the active-research side of academia, and bringing them the very latest and most cutting-edge things. Yet anyone who has put together a new syllabus for a self-designed class also knows the frustration of locating good texts for students to use. If we want to move beyond the basic medieval canon of Chaucer and Malory, and bring something fresh into the classroom, we can very quickly find ourselves far out on a limb. In my own classroom experience, I have found myself cursing the lack of a good student translation of Wace’s Brut that included material beyond the oft-anthologized Arthurian passages. Or, most memorably, spending the first week of August transcribing by hand from the manuscript facsimile and adding my own vocabulary glosses to excerpts from Caxton’s translation of the Ovide moralisé, all the while muttering to myself under my breath, “Never again!” Editions of texts that are aimed primarily at scholars (or, in the case of many of the old EETS editions that are sometimes still the primary scholarly editions for certain texts I work with, 19th-century scholars!) can feature strange orthographies, stilted hyper-literal translations, and unfamiliar typeface characters that would leave any student wondering if the professor had lost her mind – or if the Middle Ages had! Lynch, Kathryn L. Review of Chaucerian Dream Visions and Complaints, by Dana M. Symons. The Medieval Review (May 2005). Rhodes, Jim. Review of Pearl, by Sarah Stanbury. Speculum 78. 4 (October 2003): 1410-1. This is a useful addition to recent literature on eschatological writing in the first millennium. In 2011 William Weinrich published translations of some of the most important commentaries on Revelation, by Victorinus of Petovium, Apringius of Beja, Caesarius of Arles and the Venerable Bede. A second translation of Bede’s work, with an invaluable and rich commentary, was published by Faith Wallis in 2013. To these Francis Gumerlock now adds translations of two fascinating but neglected works: the late-seventh-century Commemoratorium (or ‘handbook’) and the eighth-century Pauca problesmata (also known as the as Irish Reference Bible). Both of these texts display Irish features, both in terms of their Latin and some of the sources used; but both are also known from early continental manuscripts, which reminds us of the lively international exchanges of knowledge in the early Middle Ages. Readers are encouraged to compare these texts to the rich two-volume collection of medieval Irish eschatological texts, The End and Beyond, edited by John Carey, Emma Nic Cárthaigh and Caitríona Ó Dochartaigh (2014), which otherwise lacks this kind of exegetical material. Gumerlock is for the most part a hands-off translator-editor, with an introduction and notes which provide the reader with enough guidance to understand the texts without getting too far into unnecessary complexities or new theses. The translation itself is crisp and accessible. He provides an up-to-date survey of opinions on different features of the texts in his introduction, rooted in the most recent critical editions of the texts. He takes time to set out clearly the crucial feature which might otherwise surprise or confuse any casual reader: a strong emphasis on symbolic readings of passage in Revelation, which creates an ecclesiological and/ or moral meditation on suffering. Neither author was much interested in predicting the imminence of the End through the text. Indeed, as so often in the period, the authors were more concerned with what Revelation suggested about the dangers posed by heretics and other false Christians, many to be led by Antichrist himself in the Last Days. Here, the texts represent two different ways in which long-brewed traditions stretching back to Tyconius in the fourth century continued to be developed. The two texts invite us to consider more widely the place of these kinds of commentaries in early medieval contexts. Both are fairly characterised by Gumerlock as essentially school or note books, containing a range of jottings which may have helped the author (let alone any imagined audience) to understand difficult passages of the Bible. The theological ‘world view’ of the texts comes out of the accumulation of quotations and thoughts about individual passages, rather than from any attempt to develop a coherent and sustained argument. Most books of the Bible were subjected to this kind of ‘line criticism’ in classrooms and scriptoria. Bishops and monks accumulated a wealth of traditional learning. But then, just every now and then, something resonated with a contemporary event, as when the author of the Handbook turned specifically to thinking about Arian (anti-Trinitarian) heretics, or when the author of the Reference Bible made a comment about pagan Slavs. The relationships between these moments and the wider political and social worlds in which they produced still needs more mapping out, and Gumerlock provides a valuable service to historians in making two lesser-known texts more accessible. Overall, this is a great little book, which helps to open up early medieval ideas on the apocalyptic – Insular and continental – while introducing readers to some of the key scholarly issues at stake at present. The choice of the Handbook and Reference Bible is to be praised, as these kinds of anonymous texts, while plentiful, are often neglected compared to those by named individuals. Early Latin Commentaries on the Apocalypse will be a valuable addition to many syllabi, with much to offer to anyone interested in different perspectives on the Last Things in Christian thought. Dr. Palmer has written about the Apocalypse himself, see The Apocalypse in the Early Middle Ages (Cambridge, 2014). Here, we are excited that he will soon publish a book with us entitled Early Medieval Hagiography, learn more here. Ich do invyte yow to joyne me and manye othir goode folk yn a celebracioun across the entyre globe of the erthe. Yn thys celebracioun we shal reade of oold bokes yn sondrye oold tonges. We shal singe olde songes. We shal playe olde playes. Eny oold tonge will do, and eny maner of readinge. All are welcome. We shal make merrye yn the magical dreamscape of ‘social media,’ and eke, yf ye kan do yt, yn the material plane of the ‘real worlde’ as wel. Middle English Text Series (METS), located in Rochester, NY, produces many wonderful editions of Middle English works, which can be found on their website here. We, Medieval Institute Publications, publish these editions, which can be found on our website here. This year, MIP and METS are teaming up for the Countdown to April 1st! April 1st, a.k.a. “Whanne that Aprille day,” when scholars and connoisseurs will gather to celebrate dead languages, including our favorite Middle English. This countdown was started by Geoffrey Chaucer Hath a Blog (now active as Chaucer doth Tweet), and you can read more about that here! During this year’s countdown, we plan to offer exciting posts, polls, trivia, giveaways, and release exclusive content! All of this will happen on Twitter and Facebook — where all the excitement happens! Tom Lucking, a 23-year-old undergraduate student of Landscape History at the University of East Anglia, stumbled upon the find of a lifetime this past December in Norfolk. While combing over a farmer’s field with a metal detector, Lucking and a friend were surprised when the metal detector picked up a strong signal which turned out to be from a bronze bowl buried underground (Figure 1, in situ). After uncovering the bowl, Lucking knew he had found something extraordinary, and immediately stopped to call in the Suffolk Archaeological Field Group (of which he is a member), and Norfolk County Council’s Heritage Environment Service to begin a professional excavation.Trevor Heaton, “Amazing Anglo-Saxon Pendant Joins the Ranks of Major Treasures Discovered in Our Region,” Eastern Daily Press, last modified February 27, 2015, http://www.edp24.co.uk/features/amazing_anglo_saxon_pendant_joins_the_ranks_of_major_treasures_discovered_in_our_region_1_3972534 Thanks to Lucking’s curiosity, archaeologists at the site have uncovered a seventh-century burial of a woman with jewelry and other valuable metal grave goods in the area that once was the Anglo-Saxon kingdom of East Anglia, a find nearly priceless to scholars of Anglo-Saxon history, archaeology, and material culture. How did a first-year undergraduate student make such a discovery and what can scholars glean from this finding? Looking beyond the significance of this singular discovery, what can the United States learn from the United Kingdom’s treatment of archaeological findings? I was fortunate enough to get first-hand knowledge of the discovery from Tom Lucking himself, who spoke enthusiastically about the find, sharing comments and pictures. The bowl was just the beginning of this significant discovery. Archaeologists uncovered the corpse of an adult, Anglian woman (Figure 2) and a string of artifacts dating to the mid-seventh century, including several pendants, two gold beads, a knife, an iron buckle, and a ceramic pot.Heaton, “Amazing Anglo-Saxon Pendant.” Within the burial, the woman’s body was oriented east-west, a common indication of a Christian burial, but not necessarily definitive evidence for Christian practice.Richard Hoggett, The Archaeology of the East Anglian Conversion, Anglo-Saxon Studies 15 (Woodbridge: Boydell Press, 2010), 80-1, 97; Philip Rahtz, “Grave Orientation,” Archaeological Journal 135 (1978): 3-4; Tom Lucking Interview Questions. Pre-Christian burials oriented E-W have been uncovered throughout England and Europe, which scholars like Philip Rahtz have attributed to reverence for the sun. See Rahtz, “Grave Orientation,” 4. While the religion of the woman is still contested, her social class has been easier to distinguish. Judging by the high quality of her grave goods, the woman must have been part of the nobility.Tom Lucking Interview Questions. Few inhumation graves found in East Anglia from the Middle Saxon period (c. 650–850 CE) contained grave goods, and the majority of those graves that were furnished contained only a knife, in contrast to the plethora of items interred with this woman, suggesting her high social status.Hoggett, East Anglian Conversion, 105. Within the grave deposit, archaeologists uncovered two pendants made out of Merovingian coins, one of which (Figure 3) enabled them to assign an approximate date to the burial. This coin was minted under the Merovingian king Sigebert III during the period c. 630–56 CE. His reign indicates the terminus post quem for this grave; furthermore, grave goods ceased appearing in East Anglian burials c. 720–30 CE, providing the latest possible date for the deposit. Tom Lucking Interview; Hogget, East Anglian Conversion, 104. The most spectacular find from the dig, however, was a garnet pendant (Figure 4), measuring approximately seven centimeters in diameter and inlaid with more than four hundred pieces of garnet.“History Student Digs up the Find of a Lifetime,” last updated March 6, 2015, ITV News, http://8www.itv.com/news/anglia/update/2015-03-06/history-student-digs-up-the-find-of-a-lifetime/. Even the reverse of the pendant (Figure 5) was decorated with garnets that covered the pins holding the pendant together. A piece of metalwork this intricate could have belonged only to a member of the elite in Anglian society. Craftsmen of the Anglo-Saxon period produced notable pieces of fine jewelry similar to this pendant that are now held in the British Museum and the Liverpool Museum. These institutions display a few garnet-adorned Anglo-Saxon brooches analogous to the Norfolk pendant, such as this late-sixth or early-seventh-century gold brooch found in Kent, and the Kingston Brooch, which also originated in seventh-century Kent. These museum pieces demonstrate that, while the Norfolk pendant is not an unprecedented find, it is still rare and valuable to the historical record, as the assemblage of similar Anglo-Saxon metalwork consists of only a handful of brooches and pendants. As the examples of brooch-findings above hail from Kent, the Norfolk pendant should also be contextualized within the history of other major metalwork finds from East Anglia, the Anglo-Saxon kingdom that contained Norfolk. Rarely do archaeologists find Anglo-Saxon metalwork artifacts exhibiting this level of craftsmanship in East Anglia, but archaeologists have located a few notable sites with metalwork finds in the past century. The metalwork pieces recovered from the Sutton Hoo ship burial and, more recently, the Staffordshire Hoard and the royal village at Rendlesham have received widespread attention beyond the academic community. For the public, the great archaeological finds at Sutton Hoo may be the most familiar symbols of early medieval British history; the term ‘Anglo-Saxon’ likely conjures up the image of the famous helmet from the Sutton Hoo site. Excavation of the burial mounds at Sutton Hoo began in 1939, the largest of which contained the remains of an elaborate ship burial. From this mound, archaeologists extracted the helmet and a surfeit of gold treasures, including shoulder clasps, a garnet-embellished purse lid decorated with an animal motif, a buckle for a sword-belt, and this gold belt buckle with interlace design.Note the use of garnets in the sword-belt buckle, reminiscent of the Norfolk pendant. Archaeologists have dated the Sutton Hoo ship burial to the seventh century, judging from the stylistic design of these metalwork pieces and coins found in the mound. Angela Care Evans, The Sutton Hoo Ship Burial (London: British Museum Publications Limited, 1986), 109. According to this chronology, the noblewoman found in Norfolk and the occupant of the ship burial could have been contemporaries. More recently, in July 2009, metal detectorists uncovered a cache of Anglo-Saxon metalwork known as the Staffordshire Hoard. This collection has been labeled the “largest collection of Anglo-Saxon gold and silver metalwork ever found, anywhere in the world” with over 3,500 pieces of gold and silver work, including some objects adorned with garnets.“The Find,” Staffordshire Hoard, http://www.staffordshirehoard.org.uk/about. The bulk of these items pertain to weaponry and warfare—sword fittings, cheek pieces of helmets, etc. Several items appear to parallel the style of the Norfolk pendant, like this almond-shaped garnet fitting and this triangular garnet fitting. In 2014, the excavation of an Anglo-Saxon settlement in Rendlesham received attention when metalwork pieces from the site were displayed in the National Trust Visitor Centre at Sutton Hoo.“Rendlesham Rediscovered,” Suffolk Institute of History and Archaeology, 2014, http://www.suffolkinstitute.org.uk/node/123. Scholars studying the site have theorized it was a royal settlement, possibly inhabited by the royalty buried in the mounds at Sutton Hoo, as Rendlesham is in close proximity to Sutton Hoo.“Anglo-Saxon Royal Village Discovered,” Cardiff University, March 11, 2014, http://www.cardiff.ac.uk/news/view/29492-anglo-saxon-royal-village-discovered. Investigation of the royal village commenced in 2009, but the work was kept quiet to stave off looters. The “Rendlesham Rediscovered” exhibit at Sutton Hoo in 2014 displayed gold jewelry, silver pennies, metal pieces from a smith’s workshop, and a bronze horse harness.Bill Gardner, “Newly-Discovered Anglo-Saxon Village ‘Stripped of Valuable Artefacts by Thieves’,” The Telegraph, March 12, 2014, http://www.telegraph.co.uk/news/earth/environment/archaeology/10692939/Newly-discovered-Anglo-saxon-village-stripped-of-valuable-artefacts-by-thieves.html. Though images of the treasures uncovered at these sites have become ubiquitous and easily recognizable (at least to students and enthusiasts of Old English), the reality of Anglo-Saxon material and archaeological studies is that rich find such as these are rare. Famous though they are, the few examples of Sutton Hoo, the Staffordshire Hoard, and Rendlesham demonstrate the paucity of intricate Anglo-Saxon metalwork discoveries made in East Anglia during the past century. Thus finds such Lucking’s are of inestimable value, from historical and cultural perspectives. The artifacts from the noblewoman’s burial have enabled archaeologists to gain insight on East Anglian society in Norfolk, an onerous task up to this point. The sandy composition of the soil around Norfolk often breaks down human remains rapidly (as in the Sutton Hoo ship burial where the body had disintegrated completely, leaving behind only phosphate residue) so the survival of this burial is a boon for archaeologists.Evans, The Sutton Hoo Ship Burial, 39-40; “The Sutton Hoo Ship Burial,” The British Museum, http://www.britishmuseum.org/explore/highlights/articles/k/the_sutton_hoo_ship-burial.aspx. This burial has also shed light on the socio-economic layout of the region. Lucking noted, “the area is a heavy clayland and was always considered to have been a marginal area at this time, the ground being too heavy to want to plough. It was an archaeological blank for Anglo-Saxon activity before this cemetery was discovered, and such a high status burial proves that this area was clearly not the marginal land people thought it was.” Scholars clearly have more work to do in understanding this burial and its societal context. While the future of the site is uncertain, more archaeological fieldwork may be conducted. According to Lucking, “there’s clearly a cemetery on the site, as other early Saxon metalwork has been found in the plough-soil from other burials being disturbed by ploughing. Interestingly, the other finds have all been slightly earlier, fifth to sixth century, so it would appear the site was in use over a long period of time.”Tom Lucking Interview. Lucking also indicated that the site has undergone a geophysics survey, but a more in-depth geophysics analysis could happen later as part of a full-scale excavation. The finds are currently stored in the Norwich Castle Museum, undergoing preservation and awaiting a treasure inquest, a process that came about after the English Parliament passed the Treasure Act in 1996. The Treasure Act 1996 Code of Practice, 2nd Revision, Department for Culture, Media and Sport, https://finds.org.uk/documents/treasure_act.pdf. This act was put in place to protect metal artifacts and coins of historic significance from looting and being sold illegally on the black market, which would take these artifacts out of their archaeological context and prevent them from being displayed in museums for all to see. The act specifically protects individual metal objects and groups of coins three hundred years of age or older that contain ten percent or more of gold or silver.“Summary Definition of Treasure,” Portable Antiquities Scheme, https://finds.org.uk/treasure/advice/summary; “Altered Coins as Treasure,” Portable Antiquities Scheme, https://finds.org.uk/treasure/advice/piercedcoins. Coins that do not meet the criteria for precious metal percentage fall under the jurisdiction of this law if ten or more of them are found together.Ibid. To account for historic or cultural value, metalwork objects not composed of gold or silver are protected if they are discovered in an assemblage of two or more pieces and are prehistoric in date.Ibid. The legislation also protects individually found coins if they have been modified (i.e. made into jewelry). Ibid. If anyone in England discovers anything they believe constitutes “treasure” under this definition, they are to contact a coroner or a Finds Liaison Officer in their county within fourteen days of finding it.Ibid. These officials will then begin the valuation process, where a monetary value is assigned to the treasure. If valued as treasure, the valued amount will be split between the finder and the landowner as compensation and the treasure will go to a museum for display.J.II.72, The Treasure Act 1996 Code of Practice, 2nd Revision, Department for Culture, Media and Sport, https://finds.org.uk/documents/treasure_act.pdf. If found not to be treasure, the finder may hand over the find(s) to the Portable Antiquities Scheme headed by the British Museum, but this is a voluntary act not enforced by the law.“About the Scheme,” Portable Antiquities Scheme, https://finds.org.uk/about. The Treasure Act has been effective, with approximately ninety percent of the British artifacts discovered since its passage having been uncovered by metal detectorists.Cathy Newman, “Finders Keepers? Not Always in Treasure Hunting,” National Geographic, published online March 7, 2013, http://news.nationalgeographic.com/news/2013/03/130306-finders-keepers-treasure-hunting-law-uk-us/. Remuneration for finds under this act has kept artifacts out of the illegal antiquities trade, but also kept many of these objects within their context for archaeologists to investigate properly. Once an artifact is taken from the ground, archaeologists lose the ability to study the provenance, geographic location of an object and its relation to other finds and features (man-made and natural), and the stratigraphy, or layers of sedimentation that establish different levels of archaeological contexts and enable dating of objects within them. Without studying an object’s provenance and the stratigraphy surrounding it, archaeologists cannot properly assign a date to objects or understand the culture that made it. When amateur metal detectorists locate artifacts, leave them in situ, and report them to the proper authorities, archaeologists still have a chance to study their contexts and possibly discover more artifacts and man-made features, such as walls or buildings. Archaeologists need to properly excavate in order to add to the historical narrative and enlisting the help of amateur metal detectorists has enabled many archaeologists working in Britain to do just that. If a find of the magnitude of the Norfolk burial had been uncovered in the United States, the story may have ended quite differently, as the US does not have nearly as strict laws regarding archaeological findings in place. In fact, most laws surrounding artifacts in the US differ state to state.Ibid. A few federal laws have been passed to protect finds and sites of historical value, but they do not call for members of the public to turn over artifacts to a museum or other institution for cultural preservation. The Antiquities Act of 1906 protects archaeological findings on federally owned land and the Archaeological Resources Protection Act of 1979 covers federal and Native American land exclusively.“Archeology Law and Ethics,” National Park Service, last updated May 11, 2015, http://www.nps.gov/archeology/public/publicLaw.htm. No other types of land fall under the purview of this legislation. These laws were put in place to prevent unauthorized archaeological excavations and to limit this work solely to professional archaeologists, making no provisions for amateurs with metal detectors. Given the nature of American laws concerning antiquities and archaeology, perhaps the United States could learn a lesson from England’s handling of historical artifacts. Maybe if the US government incentivized the forfeiture of finds, fewer Native American items would end up on the black market. This was almost the case for dozens of artifacts, some of which dated five thousand years old, that police recovered in Oregon in February of this year.Courtney Sherwood, “Oregon Police Seize Native American Relics Headed for Black Market,” Reuters, February 24, 2015, http://www.reuters.com/article/2015/02/25/us-usa-crime-oregon-idUSKBN0LT03K20150225. Keeping artifacts off the black market allows not only for the study and preservation of these materials, but it also provides the opportunity for these objects to be displayed in museums for the public to learn from and to appreciate. Artifacts are more than mere objects; they are pieces of history that record the lives of the many and give voices to the voiceless in the historical narrative. It is up to the living to preserve these cultural records as a testament of the past for the future. As scholars of the past, no matter our discipline or our nationality, we must act as the vanguard in this fight by producing scholarship, reaching out to the public, or, for those in the US, even contacting members of congress, asking them to take a stand in protecting the past. Fellow medievalists and scholars— especially those living and working in the United States—we should defend historical sites now before we lose them and the irreplaceable windows into the past that they can provide. Figure 1: Cover image, The Medieval Globe, vol. 1: Pandemic Disease in the Medieval World: Rethinking the Black Death. In November 2014, I and seventeen colleagues published a collection of essays in the inaugural issue of The Medieval Globe [fig. 1]. We sought to address a simple question: how could we—how should we—reconceive the Black Death in light of the new understanding of plague’s history that has emerged out of research in genetics over the past decade and a half? Since 1998, research in microbiology, and particularly molecular genetics, had seen three great achievements: in 2001, the sequencing of the genome of Yersinia pestis, the causative organism of plague; in 2010, a genetic mapping of modern plague isolates (samples of the organism) from all over the world that showed the unity of plague, that is, that Y. pestis everywhere in the world belonged to a single unified evolutionary family; and most recently, over the course of several years, the successful recovery of Y. pestis DNA from the remains of people who had succumbed to plague in centuries past, culminating, in 2011, with the complete sequencing of Y. pestis from victims of the Black Death in London. Rather than continuing to live in paralyzing doubt about what disease caused the worst epidemic catastrophe in human history, our group of historians, anthropologists, and microbiologists decided to take the leap with our geneticist colleagues and accept that plague is, and was, plague. Not anthrax, not Ebola, not typhus. And not even any unknown organism, a “black box” category about which speculation was necessarily impossible. By accepting that the Black Death was caused by Y. pestis, we could take modern plague science as a guide into the past. The plotting of the geographical distribution of different strains of Y. pestis on the global map could, potentially, be used to begin a line of questioning about events that caused the physical transfer of this single-celled organism across vast physical distances. Similarly, any modern studies about Y. pestis’s clinical presentations or animal hosts could be used analogically to draw parallels or pose hypotheses about the disease’s apparent ecology or modes of transmission described in historical sources. Modern science didn’t trump our traditional agenda of making meaning out of the past as medieval people experienced it, of course. Far from it. We argued that traditional humanist skills of interpreting language and social context have never been more necessary. In alliance with the sciences, we could perceive, through humanist lenses, a larger—and thus more terrible—history of plague. In other words, the new science didn’t end historical investigation of the Black Death. It opened new questions that forced us to expand our geographical, chronological, and methodological conceptions to explore this greatest of all human pandemics. But how to teach this new paradigm of Black Death thinking to undergraduates? The Black Death is a staple in virtually every world history, western civilization, and medieval history course that is taught, whether in K-12 or at the college level. And particularly with Rosemary Horrox’s still superb collection of primary sources on the Black Death in Europe, there are already significant resources for students and instructors to work with. But the “traditional” approach that focuses only on western Europe is no longer adequate. Teaching the Black Death—or rather, the Second Plague Pandemic in a new, lengthened chronology, from the 13th to the 19th centuries, and a broadened geography that encompasses much of the eastern hemisphere—requires something more. Could I, and my students, make the leap into this “brave new world” that incorporated genetics science into History? Well, we tried! Here’s a quick account of what we did this past semester, in my upper-level course, “The Black Death: Pandemic Disease in the Medieval World,” which I taught at Arizona State University. You can find the full syllabus here. Below are some of the highlights of the approach we took. First day: we watched the movie Contagion (dir. Steven Soderbergh, 2011). It’s not about plague (not even a bacterial disease) and it’s not medieval. But it’s great at showing panic, the erosion of societal infrastructure because of mass mortality, the strains on government and care providers in the face of an unknown killer. An added bonus is that genetic analysis and epidemiology together are presented as “heroes” in tracking down the disease. The students also did quick Google News searches for keyword combinations like “Oregon – plague – cat,” “Colorado – plague – Girl Scout,” or “Peru – plague – La Libertad.” None of my students, it turned out, had known prior to taking the course that we have plague right here in Arizona, and it was important for them to realize from the outset that plague was not just a medieval disease. Figure 2: Phylogenetic Tree; Cui, Y., C. Yu, Y. Yan, D. Li, et al. 2013. “Historical Variations in Mutation Rate in an Epidemic Pathogen, Yersinia pestis,” Proceedings of the National Academy of Science 110, no. 2: 577–82, with annotations by M. H. Green. Second week: We started our headlong introduction into the genetics. Here, we took a basic History of Science approach (the field in which I was trained). There’s been a paradigm shift in science-historical understanding of the plague, I explained to them, because of the shifts in genetics I outlined above. Hence, when you’re reading pre-2010 work vs. post-2010 work, you need to keep in mind the different conceptions of our understandings of plague history. One crucial element of genetics was that, when you have a complete genome sequence, you can study the organism down to its smallest detail. When we have multiple samples of whole genomes, we can use the very subtle differences between them to infer familial (and hence, historical) relations. I introduced them to what I call the Rosetta Stone of the new plague science: the phylogenetic tree [fig. 2] showing all the main subfamilies of the plague bacillus. Making an analogy with text-editing (we medievalists use phylogenetic trees, too, but we call them “stemmas”) was an easy way to demystify these key concepts in evolutionary science. But it was also important to discuss limitations. The new genetics is very good at telling us where the plague organism, Yersinia pestis, evolved, but not quite as good at telling us when. Third week: I realized I needed more time to explain the basics of Y. pestis evolution and its very peculiar mechanisms, both how it infected mammalian hosts and how the bacterium-flea-rodent cycle worked. We addressed all this in the context of the Justinianic Plague (ca. 541-750), with a brief look back at the evidence from Rufus of Ephesus, who described plague-like symptoms in the first century CE. In retrospect, this was too much to cover in one week, especially given how much we had to learn about plague in Antiquity and the severe devastation it caused. But they learned that the Black Death wasn’t unprecedented, a point particularly crucial in understanding attitudes toward plague in Islam, which arose as a religion during the Justinianic Plague period. Fourth and Fifth Weeks: Now we turned to the great geographical challenge of the “new plague paradigm.” Ever since 2004, the Qinghai-Tibet Plateau (in what is now western China) has been suspected as the likely origin point for Y. pestis’s evolution. This was likely also the region that saw an abrupt divergence of Y. pestis into several distinct strains, probably in the 13th century. Modern descendants of those strains are very similar to what was retrieved in 2011 from the Black Death cemetery in London. We’ve known for a long time the routes by which plague got from Kaffa on the Black Sea into the Mediterranean and then North Africa and western Europe. But how did it get from the Qinghai-Tibet Plateau to Kaffa? We still can’t answer that question, but we learned a lot about the Mongol Empire, its postal system, and the astounding levels of human migration (forced or otherwise) in this period. We also watched a neat video on hunting marmots, and learned how their use as a source of food and furs could spark a plague outbreak among humans. Sixth through Tenth Weeks: Now we turned to the Black Death’s effects in the Islamicate world and western Europe, the usual foci of Black Death narratives. (Week Nine was Spring Break, so this was just four weeks of class time.) Here, my objective was to reconceive the traditional European narrative (what I call the Boccaccian narrative) in ways that allowed us to use our “scientific” approach as a new lens in reading accounts on inexplicable death and disaster. For example, when we studied plague’s onslaught in the Islamicate world, we looked at Ibn Khaldun and Ibn Khatima (a historian and diplomat in North Africa, on the one hand, and a physician in southern Spain, on the other), both of whom had direct experience of the plague’s first onslaught. But we also looked at modern case reports of plague being transmitted by eating camel meat or by rodents scampering in nomads’ tents, as well as transmission patterns in pneumonic plague, all of which helped us think through, from the 14th-century perspectives of our sources, the inexplicable nature of the devastation. Still, reading through the historical and archeological materials on the slaughter of Jewish communities in 1348 was made no easier by knowing how palpable the fear must have been. The excavations of the Jewish cemetery at Tàrrega, in eastern Spain [Fig. 3], published in the Medieval Globe volume, only seemed more awful in linking them to evidence of pogroms elsewhere in France, Switzerland, and Germany. We saw then, as we would see in the remaining weeks of the semester (which brought plague’s history up to the present day), how intimately plague was tied to so many other currents in political and economic history. Near the end of the semester, students were still indicating that key points I had covered earlier were only then sinking in. “Oh, now I get it!” For example, because of our broadened understanding of how many different species of animals plague can move through, I had de-emphasized stories about rats alone as transmitters of plague. When we got to the Third Plague Pandemic (mid-19th to early 20th century), it was only then that they understood how the “rat paradigm” had become dominant, obscuring so much of what we needed to know about plague’s many other reservoirs. Towards the end, I asked the students to reflect on the structure of the course overall. “What do you know now that you wish you had learned earlier in the semester?” Several were satisfied with the order in which we had proceeded. One indicated he wished it had been made clear earlier why it was so significant that plague had originated in China. (This was a reminder to me that teaching in a global mode brings its own demands.) Some wanted more science: one asked for more information about animal vectors, another for more on environmental factors. One wished we had addressed earlier the documentary lacunae and the fundamental problem that, for a pandemic of such wide geographic dimensions, no single scholar was ever going to be able to have command over all the languages, let alone types of skills, necessary to investigate this phenomenon. What were my desiderata? What would I do differently next time? Fleshing out the central Asian narrative is still the biggest need in terms of finding primary sources, whether documentary or bioarcheological. We still have to wait before much can be said about sub-Saharan Africa and the genesis of the still-extant plague strains there. And much more needs to be done on plague in other areas of Eurasia in the early modern period. But overall, I was pleased that the course was able to present a cohesive and coherent narrative for plague’s global history. The course drew students from history, anthropology, and the sciences, and all were able to develop research projects that connected with their interests. My one oversight? Not anticipating the depressing effect of dealing week after week with death at this appalling scale. The still on-going Ebola outbreak (which we talked about periodically and addressed explicitly at the end of the course) only added to the effect. We were facing Dementors without the benefit of any patronus charm to defend us. Chocolate helped. As did, ultimately, the conviction that although plague has not been (and likely never will be) eradicated, knowledge of the history of this dreadful disease is the best defense we have. 1: Cover image for Pandemic Disease in the Medieval World: Rethinking the Black Death. 2: Phylogenetic tree: Cui, Y., C. Yu, Y. Yan, D. Li, et al. 2013. “Historical Variations in Mutation Rate in an Epidemic Pathogen, Yersinia pestis,” Proceedings of the National Academy of Science 110, no. 2: 577–82, with annotations by M. H. Green. Pentafillos (Cinquefoil) and Columbaris (Vervain) from Pseudo-Apuleius Herbal, 11th century, Bodleian MS Ashmole 1431, fol. 6r. The Old English Herbarium credits Pentafillos, or ‘fifleafe’ in Old English, as a curative for anything from joint ache to stomachaches and headaches to even ulcers. To the author’s knowledge, however, the efficacy of fifleafein these recipes has not been tested recently. At this year’s Society for General Microbiology’s Annual Conference, researchers from the University of Nottingham presented results from tests using a modern recreation of a 10th-century cure for a stye (an infected eyelash follicle). This Anglo-Saxon eye-salve recipe, found in a manuscript called Bald’s Leechbook, effectively killed up to 90% of MRSA—a bacteria that is resistant to modern antibiotics—in in vivo wound biopsies from mouse models.According to the U.S. National Institute of Health, over the past four decades MRSA, Methicillin-resistant Staphylococcus aureus, has “evolved from a controllable nuisance into a serious public health concern,” because, until the re-discovery of this Anglo-Saxon remedy, it remained extremely difficult to cure. MRSA, also commonly known as “staph,” is one of the most common hospital-acquired infections, typically entering the body through an open wound. Recently, however, new strains have emerged that are capable of causing severe infections and pneumonia, and a variety of other symptoms including difficulty breathing, fever, and chills in otherwise healthy people. Wyrc eagsealfe wiþ wænne: genim cropleac 7 garleac begea emfela, gecnuwa wel tosomne, genim win 7 fearres geallan begean emfela, gemeng wiþ þy leaces, do þonne on arfæt, læt standan nigon niht on þæm arfæt, awring þurh claþ 7 hlyttre wel, do on horn 7 ymb niht do mid feþere on eage; se betsta læcedom. Make an eye salve for a stye: take cropleac ‘onion’ and garlic equal amounts of both, pound well together, take wine and bull’s gall equal amounts of both, mix with the ‘leeks’, then put in a brass vessel, let stand for nine nights in the brass vessel, strain through a cloth and clear well, put in a horn and about night time put on the eye with a feather; the best remedy. Cameron hypothesizes that the ingredients in the eye-salve prescription were likely to be helpful in combating and inhibiting the growth of bacteria, like staphylococcus. However, replicating cures from Anglo-Saxon and medieval medicine can be problematic, especially when one term can be used to refer to multiple types of herbs, as Stephen Pollington notes. Also, it is difficult to link Old English plant names to modern species, as climate and environmental factors have changed since the tenth century, altering current types of vegetation. What’s more is that often the Anglo-Saxon prescriptions are vague in the quantities of each ingredient, and therefore these recipes have often been discounted or overlooked by modern researchers and scientists. When Barbara Brennessel, Michael Drout, and Robyn Gravel tested the eye-salve recipe in vitro against common disease-causing bacteria in 2005, they found these issues to be challenging in recreating an effective medication. Their historic-pharmacological approach involved interpreting the Anglo-Saxon recipe, determining the specific ingredients and their quantities, and then testing the compounds on different bacteria strains in petri dishes, using the Kirby-Bauer method. While their version of the compound eye-salve recipe did not prove to be effective in their experiments, they did find that individual ingredients, such as oxgall, did inhibit growth of some types of bacteria. Nonetheless, the approach by Nottingham researchers appears to be similar to the tests done by Brennessel, Drout, and Gravel, but the results of their interpretation of the Old English prescription produced more positive outcomes this time around. Lupinum (lupine), depicted on left page, top right-hand side from Pseudo-Apuleius Herbal, 11th century Bodleian MS Ashmole 1431, fols 27v-28r. One issue involving the study of Anglo-Saxon medical treatises is that the transcriptions and translations that are readily available are mostly from the mid-nineteenth century, like the one above by Oswald Cockayne. Cockayne was the first person to edit, transcribe, translate, and publish the Anglo-Saxon leechbooks in three volumes for the Rolls Series between 1864 and 1866. Several misconceptions of Anglo-Saxon medicine and culture were perpetrated while Cockayne’s edition remained the most accessible version, according to contemporary critics, such as Linda Voigts and Anne Van Arsdall.Victorian audiences at the time of Cockayne were wary of medical recipes involving prayers, charms, and supernatural explanations. All of these are included in the leechbooks and are also present to a certain degree in many medieval and Renaissance medical treatises. Since this period, this early critical wariness has been frequently used as an excuse to write off earlier forms of scientific knowledge. Furthermore, it can be easy to see how aspects of anatomical descriptions and herbal prescriptions may seem foreign to modern physicians and scientists, as they are often rooted in humoral theory. Today doctors no longer ascribe to the notion of the four humors, and this is another reason medieval medical cures tend to be overlooked until they are translated into our modern notions of “scientific” practices. Though the recent experiments with the eye-salve cure have reached a wider audience in the news, this is not the first time that contemporary physicians, researchers, and Medievalists have turned to Anglo-Saxon medicine in hopes of re-discovering possible remedies for illnesses. Betonice (betony), from 11th-century Old English Herbarium in London, BL Cotton Vitellius C. iii, fol. 20r (facs). Held at Newberry Library, Chicago. Photo credit: Sarah Gillette, 2015. Likewise, Marijane Osborn assesses recipes associated with pregnancy and childbirth in Leechbook III and attempts to determine the degree to which the pharmacology of the flowering herbs that appear there might achieve the actual effects being sought by those women. For example, if a woman has difficulty expelling the placenta after giving birth, one recipe from this leechbook recommends a hot drink made from boiled brooklime (Veronica beccabunga) in ale. Osborn states that brooklime can function as an emmenagogue, or a plant that promotes menstrual flow, and that the chemicals in this caudle would help expel a blocked placenta. However, as researchers found with the eye-salve recipe, the exact herbal quantities and dosages of each treatment were probably transmitted orally from doctor to apprentice-in-training, instead of being included in written form. For this reason, herbs like brooklime, or pennyroyal, which is in a recipe that aids in expelling a dead fetus, can become extremely dangerous to women if misused. They, like the some of the other herbs mentioned above, are pharmakons and can either heal or poison the patient. So how do we advance medicine, when faced with material that may provide answers but can be difficult to interpret, or may be missing crucial information due to a variety of reasons? In an interview, Christina Lee made some important points about interdisciplinarity and research: “modern research into disease can benefit from past responses and knowledge, which is largely contained in non-scientific writings. But the potential of these texts to contribute to addressing the challenges cannot be understood without the combined expertise of both the arts and science.” Perhaps a new way of thinking is needed in order to understand and to relate earlier medical writings to our modern-day lives. It is true that Anglo-Saxon scholars have attempted to overcome earlier translations and criticism that sought to separate and emphasize the “rational” (“scientific” and “practical”) medicine from those elements which were judged to be “non-rational” (e.g., “supernatural” or “magical” or “literary”). However this mindset needs to encompass more than just an “either-or” methodology and taxonomy. Kelly L. Bezio and Ashley Reed note that “even the multi-disciplinary subfields […] tend toward the dyadic thinking of secularization: literature and medicine, medicine and religion, religion and literature. But these academic pair bonds rarely tell the whole story about an event or idea.” Thus, we need to move beyond our entrenched modes of inquiry and seek a more global and interdisciplinary approach, all the while respecting the knowledge and culture of our ancestors. Note: The first two images are from http://www.bodley.ox.ac.uk/dept/scwmss/wmss/medieval/mss/ashmole/1431.htm. The third image is from a facsimile of Cotton Vitellius C.iii owned by the Newberry Library and photographed by Sarah Gillette. London, BL Royal 12, D xvii: Bald’s Leechbook (Old English medical compendium). 10th-11th century. View at http://www.bl.uk/onlinegallery/onlineex/illmanus/harlmanucoll/m/011hrl000000055u00001000.html. London, BL Cotton Vitellius C.iii: Old English Herbarium and Medicina de quadripedibus. Early 11th century, Old English. London, BL Harley 585: Lacnunga (Old English medical compendium). Late 10th-early 11th century, Old English and Latin. View at http://www.bl.uk/manuscripts/Viewer.aspx?ref=harley_ms_585_f130r. Oxford, Bodleian MS Ashmole 1431: Pseudo-Apuleius Herbal. 11th century, Latin. 1. ↑ “Researchers from Nottingham Rediscover Anglo-Saxon AntiMicrobial,” Society News, Society for General Microbiology, 31 Mar 2015, https://www.microbiologysociety.org/news/researchers-from-nottingham-rediscover-anglo-saxon-antimicrobial.html. 2. ↑ “Understanding Antimicrobial (Drug) Resistance,” U.S. National Institutes of Health, 3 Apr 2012, http://www.niaid.nih.gov/topics/antimicrobialresistance/examples/mrsa/pages/default.aspx. 3. ↑ M. L. Cameron, Anglo-Saxon Medicine (Cambridge: Cambridge University Press, 1993), 186. 4. ↑ Thomas Oswald Cockayne, ed., Leechdoms, Wortcunning, and Starcraft of Early England, 3 vols. (London: Longman, 1864-66), II, 34. 5. ↑ (trans. by Cockayne). 7. ↑ Stephen Pollington, Leechcraft: Early English Charms, Plantlore and Healing (Hockwold, Norfolk: Anglo-Saxon Books: 2000). 8. ↑ Carole Biggam offers an example of this difficulty by highlighting the term hæwenhnydele, which occurs eight different times in the OE corpus and is linked to the Latin plant name herba britannica. Scholars have been divided on how to interpret this term and exactly which plant it relates to. See “Hæwenhnydele: An Anglo-Saxon Medicinal Plant,” Botanical Journal of Scotland 46.4 (1994). 9. ↑ Barbara Brennessel, Michael D.C. Drout, and Robyn Gravel, “A Reassessment of the Efficacy of Anglo-Saxon Medicine,” Anglo-Saxon England 34 (2005), 183-95. 11. ↑ Linda E. Voigts, “Anglo-Saxon Plant Remedies and the Anglo-Saxons,” Isis 70.2 (June 1979), 250-68. See especially pages 252-54. Anne Van Arsdall, Medieval Herbal Remedies: The Old English Herbarium and Anglo-Saxon Medicine (New York: Routledge, 2002), 35. 12. ↑ Peter Dendle, “Lupines, Manganese, and Devil-Sickness: An Anglo-Saxon Medical Response to Epilepsy,” Bulletin of the History of Medicine 75.1 (2001), 91-101. See especially page 91. 15. ↑ Frances Watkins, Barbara Pendry, Olivia Corcoran, and Alberto Sanchez-Medina, “Anglo-Saxon Pharmacopoeia Revisited: A Potential Treasure in Drug Discovery,” Drug Discovery Today 16:23/24 (December 2011), 1069-75. 17. ↑ Valerie Thomas, “Do Modern-Day Medical Herbalists Have Anything to Learn from Anglo-Saxon Medical Writings?,” Journal of Herbal Medicine 1 (2011), 42-52. 18. ↑ Marijane Osborn, “Anglo-Saxon Ethnobotany: Women’s Reproductive Medicine in Leechbook III,” Health and Healing from the Medieval Garden, ed. by Peter Dendle and Alain Touwaide (Woodbridge: Boydell, 2008), 145-61. 20. ↑ Sarah Knapton, “Anglo-Saxon cow bile and garlic potion kills MRSA,” The Telegraph, 30 Mar 2015, http://www.telegraph.co.uk/news/science/science-news/11504166/Anglo-Saxon-cow-bile-and-garlic-potion-kills-MRSA.html. 21. ↑ [emphasis in the original] Kelly L. Bezio and Ashley Reed, “On the Limits of Disciplinarity: Literature, Medicine, Religion,” Literature and Medicine 32.2 (Fall 2014), 240-48. In October 2012, Dr. Monica Green, Professor of History at Arizona State University posted an informative commentary on the medieval medicine listserv MEDMED-L to explore the dangers that arise when decontextualised (and cropped) medieval manuscript images circulate freely on the Internet and are used for retrospective (iconographic) diagnosis. Green focused in particular on this now iconic and ubiquitous representation of the Black Death taken from James le Palmer’s Omne bonum (British Library MS Royal 6 E. VI f.301, 1360-1375). 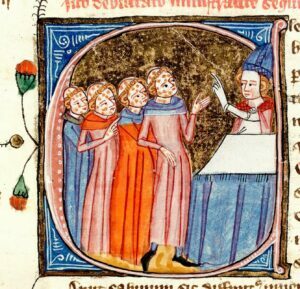 The image, however, is decidedly not about the plague; rather, it shows in the detail of an historiated initial ‘C'(lericus) clerics with leprosy receiving instruction from a bishop. While art historians have long known what this image portrays, it was mislabeled as a plague image when the British Library’s digitization process removed it from its original textual context. It is not difficult to see how the mistake happened: the Black Death affected millions of people across Europe, caused visible physical symptoms, and coincided roughly with the production of the Omne bonum manuscript. By 2006, the Library made the image available for download on its website; after that, the mislabel appeared on virtually all further uses of the image, including on Wikipedia and a large number of other Internet sites, in popular and scientific publications, in exhibits, in lectures, and even in television documentaries. In short, the image became widely accepted as a representation of the “plague” because that was what its label said it was. Figure 2: James le Palmer, Omne bonum. London, BL MS Royal 6 E. VI, vol. 2, f.301rb. “Clerics with leprosy receiving instruction from a bishop.” Image from British Library Catalogue of Illuminated Manuscripts. Using this image as an object lesson in how quickly and widely misinformation can spread in the digital age, Green, together with Kathleen Walker-Meikle and Wolfgang P. Müller, recently published a cautionary tale of how such misinterpretation comes about and what makes it so prevalent in ‘Diagnosis of a “Plague” Image: A Digital Cautionary Tale’ in The Medieval Globe. Importantly, Green and her colleagues published the complete text of the chapter that the image was meant to illustrate. There, it is very clearly stated that the topic of the chapter is how to decide what should be done when a cleric suffers a disabling condition that prevents full performance of his pastoral duties. Leprosy is the most frequently mentioned condition in the text, and the image reflects the contemporary iconographic convention of using spots to show leprosy. Plague is never mentioned at all, which makes sense because, as a quick killer, it was irrelevant in a discussion of chronic conditions. Published open access and widely circulated, the article has already generated considerable discussion, on both the Internet and elsewhere. But what about all those many mislabeled copies of the Omne bonum image that are still found all across the Internet? Can the damage be undone? As we are finding out, it is indeed possible to put the genie back in the bottle – or perhaps more (or less) poetically, to get the toothpaste back into the tube – at least to some extent. “We,” in this context, refer to Green, Richard Nevell, a British PhD archaeology student and Wikipedian, and me, a Canadian PhD candidate in medieval and medical history. Together, we have taken on the at-times daunting task of tracing (and hopefully correcting) the spread of the mislabelled Omne bonum image through cyberspace. My own involvement in this project began when I noticed that the October 2014 issue of BBC History Magazine included the Omne bonum image, complete with the erroneous labelling, in its response to a reader’s query about the microbiological causes of the plague. Using The Medieval Globe article as backup, I contacted the magazine’s editors to inform them about the error; a few weeks later the editor-in-chief responded and said that he would pass the information on to the magazine’s picture library (which, not coincidentally, had gotten the image from the British Library). Already by that time, Green had prepared an initial list of major websites and publications that were using the mislabelled image. She was also in touch with the British Library, requesting that it re-label the Omne bonum image correctly to correspond with its original meaning and that it announce The Medieval Globe article. Changes were made eventually to both the Catalogue of Illuminated Manuscripts (CIM) and the Library’s Images Online site by early December 2014. Green sent out a tweet on 3 December 2014 (@monicaMedHist) to further share information about the image’s misdiagnosis and the article that unveiled it, and used the tweet to update the MEDMED-L list about the image. After a reminder, the British Library (@BLMedieval) tweeted about the article on 15 January 2015. Figure 3: James le Palmer, Omne bonum. London, BL MS Royal 6 E. VI, vol. 2, f.300v. “Bishop addressing clerics on a pilgrimage.” Note the instructional theme of this section of the manuscript. Image from British Library Catalogue of Illuminated Manuscripts. Also at the same time, Green connected Richard and me. Richard, having seen an advance announcement about the forthcoming study in The Medieval Globe, had approached Green about the misuse of the “plague” image and was doing some investigative work into the details of its use on Wikipedia. As Richard explained to us, someone had uploaded the image to Wikimedia Commons on 22 August 2006, sourcing it from the British Library’s Images Online site, and then added it to the Wikipedia article on the Black Death using the caption “Monks, disfigured by the plague, being blessed by a priest. England, 1360-1375.” Although someone else removed the image on 1 December 2011, it was reposted nearly three weeks later with a slightly more detailed caption: “Plague victims being blessed, shown with symptoms from a late 14th century manuscript Omne bonum by James le Palmer.” Richard’s early research showed that the mislabeled Omne bonum image appeared in twenty-three different language Wikipedias on forty-four different pages, with another two uses on Wikibooks and Wikiquote. Given that some 500 million people visit Wikipedia every month, correcting this misdiagnosis would have the potential to have a significant impact; indeed, over the course of the previous year, the English Wikipedia’s page on the Black Death had 4.3 million views. Fortuitously, by 5 December, an anonymous editor had taken the initiative to remove the Omne bonum image from the English Wikipedia Black Death page and from all other pages on the English Wikipedia; s/he had also renamed the image file from “Plague victims blessed by priest” to “Leprosy victims taught by bishop” (the discussion forum behind those pages indicates that this was done in response to The Medieval Globe article). Richard followed this up with some edits of his own and with a Wikipedia blog post on 16 January 2015 calling for volunteers to help edit the pages in other languages. Figure 4: James le Palmer, Omne bonum. London, BL MS Royal 6 E. VI, vol. 2, f.394r. “[Emperor] Constantine and a group of men in discussion.” Note the spots on Constantine’s face, used to represent his case of leprosy. Image from British Library Catalogue of Illuminated Manuscripts. This left the broader Internet search. A reverse Google image search quickly showed that, as of 9 December 2014, there were possibly some five hundred sites using the Omne bonum image as if it were a plague image. A daunting prospect indeed. However, a quick scroll through the search results showed that many of those sites were sub-pages of a variety of answer.com, Tumblr, Pinterest, and Hubpages websites that we could reasonably ignore for now. Others included blog or media posts old enough that they were unlikely to be changed. To manage those sites that were good candidates for modification, I created an Excel spreadsheet (based on and including Dr. Green’s initial list) on which I recorded detailed information about the sites that appeared to be broadly appealing to a wide audience and/or to have academic purposes. This information included: page title, URL, general information (about the site itself), placement of image (on the site), exact caption used, source of image (if noted), contact information, date contacted, response, and verification (of any change made to the site). Finding the contact information for some of the sites proved to require a fair bit of online sleuthing. I then contacted the site owners/managers individually by email or through the website contact section to inform them about the mislabelled image. I invited them to change the caption or to remove the image and asked them to let me know, if they recalled, from where they had originally sourced the image (where that information did not explicitly exist on their site). I also provided them with a direct link to The Medieval Globe article. So where do we stand now? Dr. Green’s initial tweet received at least twenty-five retweets, while the tweet from the British Library has been retweeted at least twenty-six times. The Wikipedia blog was retweeted several times, and was further circulated on Facebook. The Omne bonum image has been removed from twenty Wikipedia plague-related pages, and is now used instead in the English history of leprosy article (The Medieval Globe article is also used on that page as a source reference). The image remains on nineteen plague-related pages across fifteen different language Wikipedias, where work continues to remove them. Between 9 December 2014 and 25 January 2015, I sent emails to the identified contact person for fifty-two websites. Of these sites, twenty-seven (52%) had an obvious educational or academic purpose (being either clearly identified as school/curricula sites or specifically designed to provide information, such as publishing house sites), twenty (38%) were personal or group blogs (historical fiction writers, for example), three (6%) were media sites, and two (4%) were commercial stock photo sites. As of 11 February, I have received twenty-nine responses (56%). The majority of those responding (twenty-two or 76%) have removed the image or changed its caption; one of these, a commercial stock photo site, also took the initiative to notify its distributors of the updated caption. Several other responders indicated that they were leaving it as is, because they intend to use it as a “teachable moment on the use of medieval manuscripts and images” or because their site is no longer active. Wikipedia and the British Library were the sources of most of the images. Thanks to numerous digitization projects, we now have access to medieval images in a way that has never been possible before. In contrast to texts, which require thought and interpretation, images seem to speak to us directly in an appealing way. Few people can read Latin, but everyone believes that they can understand an image, even one from seven hundred years ago. As the old adage says, “a picture is worth a thousand words.” The caution here, is that when we are too eager to simply copy and circulate images without considering their historical context, the thousand words that we read into them might not be the right ones. It may not seem important that the Omne bonum image reflects leprosy rather than the plague – one disease rather than the other. But someone created it, after all, to tell a specific story, and reading the wrong thousand words into it means that we miss the story he wanted to tell us, in this case about another frightful disease. Besides, the text of the Omne bonum chapter that Green and colleagues edited (and translated) is almost exactly one thousand words long; in this particular case, people have actually been given the one thousand words that they need to understand this image and it is worthwhile for them to read them. Why does it matter if some images are mislabelled? It reminds us of the critical importance of context in using historical artefacts, including images, to reconstruct – and understand – the past. Issue 1 of The Medieval Globe: Pandemic Disease in the Medieval World: Rethinking the Black Death (2014) is now available for purchase.